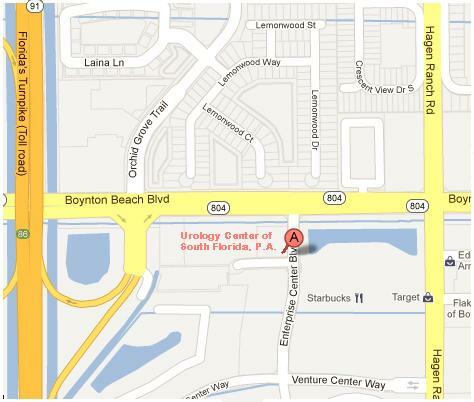 Urology Center of South Florida, P.A. Take FLORIDA'S TURNPIKE S toward MIAMI (toll road). Merge onto Exit 86 (Boynton Beach Blvd.) then turn right (head east) to Enterprise Center Blvd. (Chevron gas station). Make a right onto Enterprise Center Blvd. 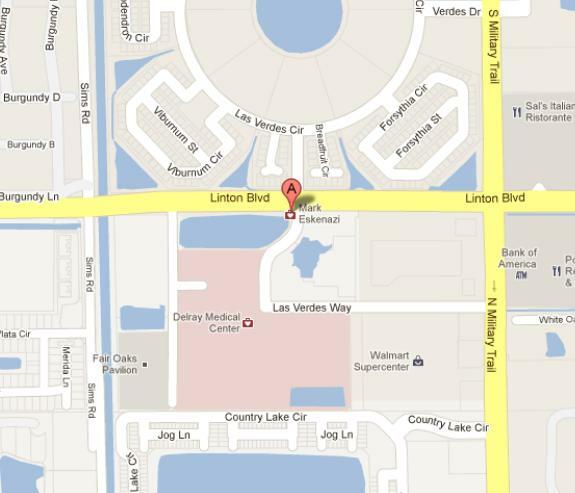 The Boynton Beach Medical Plaza, 10151 Enterprise Center Blvd., is on the right. Take FLORIDA'S TURNPIKE N toward ORLANDO (toll road). Merge onto Exit 86 (Boynton Beach Blvd.) then turn right (head east) to Enterprise Center Blvd. (Chevron gas station). Make a right onto Enterprise Center Blvd. The Boynton Beach Medical Plaza, 10151 Enterprise Center Blvd., is on the right. Exit at Linton Blvd. Head west to Military Trail. Head south on Military Trail and then make your first right hand turn. The 5210 building will be on your right opposite the emergency room entrance to Delray Hospital.